Well, with Valentine's Day coming up, I am really in the mood for writing about l-o-v-e, but here's something a little bit different. No, it doesn't include that kind of Valentine's love, but what I am going to write about, well, I absolutely love! 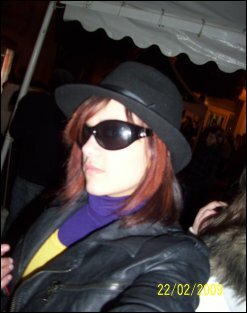 In Malta, the country where I live, in February we celebrate Carnival. This year Carnival Sunday is going to be on the 14th of February - Valentine's Day! I can imagine the madness that there is going to be in the upcoming weeks. Whenever you go into a stationery you will find the ultimate chaos! People going in trying to find the perfect costume for carnival and others trying to find the bestest Valentine's Day card they can find! 'Cause, yeah, here in stationeries they sell costumes as well - we're different! xD. 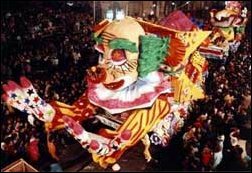 In Malta, Carnival has been celebrated since the arrival of the Knights of Saint John in 1535. Some studies suggest that the first Carnival was held back in the year 1470. 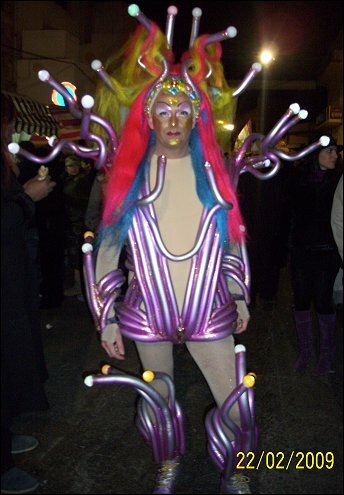 The most famous Carnival held in Malta is 'The Street Carnival', most often referred to as 'The Spontaneous Carnival'. A street in a particular village is chosen, and people of all ages go to this street and parade up and down showing off their costumes. The costumes range from adults dressed up as babies to teens dressed up as old people! There are also small floats going up and down the street, made by groups of friends who, from months in advance, have been preparing for this particular event! A traditional costume which people here in Malta and Gozo like to wear is 'The Maskarati' which includes of an old boiler suit and a hideous mask (the more hideous the better!) so that no one recognizes you, and in the meantime you can scare people as much as you want! There are also musical acts by local artists performed along the roadside. People tend to get drunk while walking, and it's not a surprise if you see someone sleeping on the side of the street. Apart from this type of Carnival, there is also the organized Carnival, in which local councils and the government join together to hold dance and float competitions in different localities in Malta and Gozo. At the end of each competition the King of Carnival comes in, a float made of papier-mache, which is usually the biggest float amongst the other competing floats. In the dance competitions, there are also entries by school classes and other non-governmental organizations. In the village in which I live, Xaghra, which is on the island of Gozo, there is the tradition of the dance 'Il-Kumittiva' which is performed by several men, women, and young children, dancing around the square in traditional Maltese costumes, accompanied by folkloristic music. All in all, Carnival for me is a really wonderful time of year, because in it one can frolic and have fun without anyone caring a bit about what anyone else is doing or saying. Here the Carnival spirit lives on, and year after year more tourists visit Malta with the sole purpose of joining the revelry of the Maltese Carnival. Hope you readers will do that too one day !! Author's Note: I took these photos from the Malta and Gozo Carnival mentioned above. Editor's Note: Malta is an island chain in the Mediterranean Sea, south of Sicily. Gozo is the second largest island in this group.